This woodcut is from page 9. According to Stevenson, it was taken "from a painting made from a photograph which Apostle F. D. Richards had taken while on a visit to this historic hill and country." Stevenson wrote, "Brother Edward Holt, of South Jordan Ward, had a vision of the hill (similar to the one the prophet Joseph Smith had,) and described it very minutely before seeing the picture of it. He said, just above where he saw a portion of the top of the stone box there was a tree, and upon this point I interrogated him closely, stating that only two years previous Bishop Black, Brother Andrew Jenson and I had visited the spot of ground, and there was no tree there; but he insisted that there was a tree just above the stone box, a clumpy tree, for he saw one there. It became necessary for an explanation before he should see the picture. "At the period of the discovery of the gold plates, there stood upon the side of the hill, about fifteen feet above where the stone box had so long reposed, a lone, solitary, sugar maple tree, and there continued to grow until twenty-two years ago, just as described by Brother Hold, who was so highly favored of God as to see the whole scene in a vision or dream. "What made Brother Holt's vision all the more deeply interesting to me was that in 1871 I had enjoyed the great privilege and pleasure of visiting the hill in person, and of seeing the very identical spot of ground where Mormon concealed the stone box and its precious records and where Moroni, his son, finished the writing and sealed up these records." I'm curious what made Stevenson think Mormon concealed the stone box. Stevenson interviewed David Whitmer in 1870, 1877, 1879 and 1886. He was acquainted with David in 1833 and in 1838, when David was disfellowshipped at Far West, Missouri. Stevenson made this interesting comment about what David Whitmer told him in 1877. It's on page 14 of the book. "It was likewise stated to me by David Whitmer in the year 1877 that Oliver Cowdery told him that the Prophet Joseph and himself had seen this room and that it was filled with treasure, and on a table therein were the breastplate and the sword of Laban, as well as the portion of gold plates not yet translated, and that these plates were bound by three small gold rings, and would also be translated, as was the first portion in the days of Joseph. When they are translated much useful information will be brought to light. But till that day arrives, no Rochester adventurers shall ever see them or the treasures, although science and mineral rods testify that they are there. At the proper time when greed, selfishness and corruption shall cease to reign in the hearts of the people, these vast hoards of hidden treasure shall be brought forth to be used for the cause and kingdom of Jesus Christ." We can ask ourselves, have we removed greed, selfishness and corruption from our hearts? Probably not, since we don't have these records yet. Stevenson mentioned the Rochester Company on page 13. He saw cavities made on the east side of the hill by these Rochester treasure seekers. President young said "I take this liberty of referring to these things so that they will not be forgotten and lost." Stevenson pointed out that President Young made the statement "just two months and twelve days before his death." Page 14. A fun part of Stevenson's book is his belief that Lehi landed in South America and that the ruins in Palenque were one of the Nephite temples. 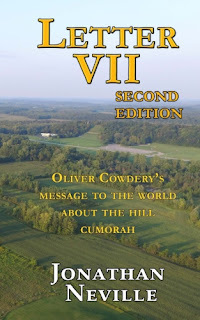 Then he writes, "But who is there that is able to tell the story of those mound builders, excepting their own revealed history?" It's an interesting point, because today archaeologist and linguists are uncovering and translating numerous Mayan records. We know details of dates and names for many of the civilizations in Mesoamerica. But the ancient inhabitants of North America left no record--except for the Book of Mormon. Stevenson like his contemporaries believed in a hemispheric model of Book of Mormon geography. He claimed the Book of Mormon contained "an explanation of the ruins found in North, South and Central America." 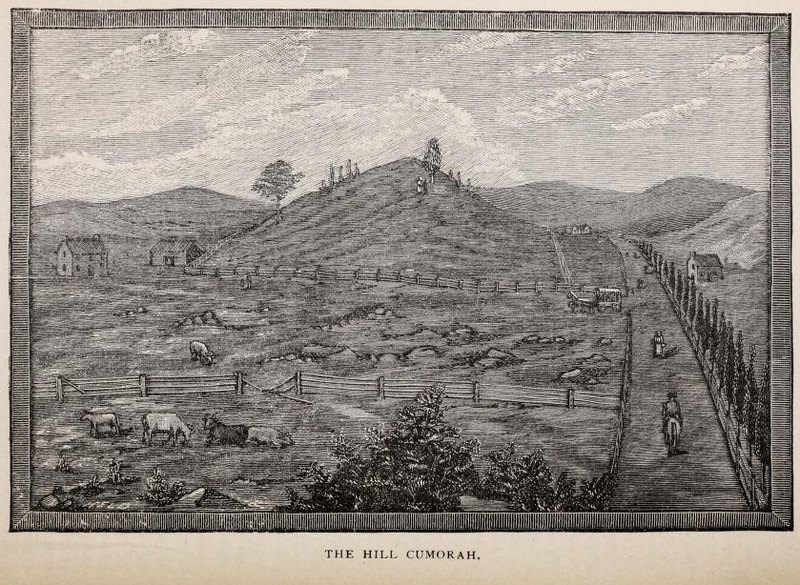 Stevenson writes, "At one time a fierce battle was fought near where Buffalo, N.Y., now stands, wherein two million were lying strewn upon the earth, slain in battle and no one to bury them, till the stench drove them southward to the Hill Ramah, which was called Cumorah by the Nephite race." Later, he writes, "Coriantumr, weak, wounded and alone, had to wend his way about 3,000 miles to Zarahemla, where he remained until his death and was buried by this strange people." Of course, I think he only had to "wend his way" about 1,000 miles down the rivers to the land of Zarahemla, probably somewhere between modern-day Cairo, IL and St. Louis, MO. On page 20, after relating the account from Lucy Mack Smith's History regarding Moroni delivering the plates to Joseph Smith, Stevenson writes "In 1834 I first listened to this Prophet of God, who related this vision he had been favored with. The honest and power of his expression carried conviction with it." This is an awesome illustration you don't see often. I don't remember seeing it other than in this book.